Good News to all talented Artists in the Cameroon Music Industry. 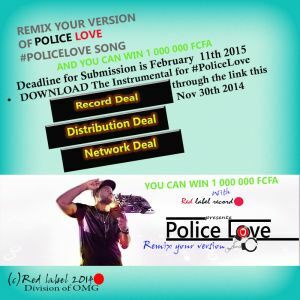 In association with Overseas Music group, Red Label has decided to encourage, support and empower Cameroonian Artists by providing an opportunity to A talented Artist in the fast growing Cameroon Music industry to Win 1 000 000 CFA (One Million Fcfa) by remixing their #PoliceLove theme song. The 2 runner ups of the competition will also win 500 000 (five Hundred Thousand fcfa) each. See the Instructions, Prizes, How to Enter and Judging information below. Good Luck to all Artists! Now lets see who wins the 1, 000 000cfa and the 2 lucky artists who win 500 000 each. Instructions •	Be Creative •	There are no boundaries to the theme of your remix so don’t feel creatively boxed in because of the name of the competition •	No Curse words •	Mention Red Label record give you the remix #PoliceLove at least once in Your Lyrics •	Deadline for Submission is February 11th 2015 Prizes •	The Winner Gets 1,000,000 fcfa credited to their Bank Account and a Record Deal with Major Soft Touch (Producer of Njama Njama Cow) •	Distribution Deal with network in Africa •	2 runner ups (Second through 3th Position) get 100,000 fcfa credited to their Bank Account How to Enter •	DOWNLOAD The Instrumental for #PoliceLove through the link this Nov 30th 2014 •	Record your Remix to #PoliceLove beat and mix it as well as you can •	Upload your remix to www.overseas-musicgroup.com here •	Make sure you Title your Remix [Your Artist Name] – •	#Policelove •	Tag (Enter in the Tag Field) your mix #PoliceLove when uploading to overseas-musicgroup.com •	Use the Cover Art and attach it to your uploaded Remix on overseas-musicgroup.com •	Go To Your Remix and Share it with ALL your Friends and Fans! •	FINAL STEP will be to FILL THE FORM BELOW to OFFICIALLY SUBMIT YOUR ENTRY Territories Central Africa ONLY Judging •	Any remix that includes curse words will be disqualified. •	Participants in this competition are encouraged to Share their songs and get as many people to listen, download and like them •	The Remixes will be JUDGED by our partners who will pick the TOP 10 Finalists •	To be considered for Judging you must have at least 30 DOWNLOADS •	The WINNER of the competition will be determined by VOTES from the TOP 10 Finalists •	Read the Terms and Conditions COMPETITION SUBMISSION FORM *UDATE* THE FORM HAS BEEN REMOVED. The Deadline to submit has passed. Good Luck to all who submitted their remix version *UPDATE* The Playlist below will be updated when entries for the contest are submitted, so verify your remix is in the playlist.